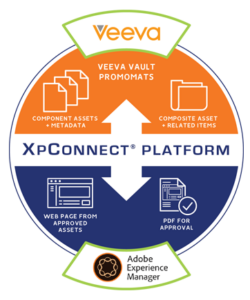 Adobe Experience Manager (AEM) and the Adobe Marketing Cloud suite of products are leading products in the marketing automation, authoring and DAM solution, and can also be enabled as the single source of truth using our XpConnect Platform. Management (DAM) with review and distribution capabilities and enables either DAM to be thesingle source of truth. the enterprise. Customers can synchronize assets and metadata between both systems. Content authored in AEM is sent to Vault PromoMats for review and approval. Vault provides the central DAM that publishes content via AEM to websites and other channels. With XpConnect TM integrating both platforms, tremendous benefits are achieved. Significant cost reduction of the Digital Asset Lifecycle. Reduction of dual entry and asset creation across systems. Increased quality and elimination of rework. Improved regulatory and compliance risk management. Ability to print a PDF of full website for compliance taking minutes versus weeks of time. Critical piece of the Roadmap to migrate to a Single Source of Truth solution.